This 2-inch gauge with a graphics display can be configured to read out as any type of gauge. It is ideal for stand-alone applications or to expand an instrumentation system. Because it interfaces directly to the J1939 CAN data bus and because of its heavy-duty construction-grade design, it may be installed anywhere on a vehicle. Although it is a standard product, it is highly configurable to your specific application. Backlight colors, application specific graphics, and decals can all be changed. As with all VIS standard products, our engineering team can customize it faster than other suppliers. That is because of our investment in versatile design software and best-practice project management. 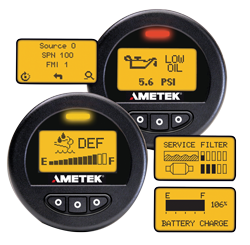 AMETEK VIS' C-COM 2G CAN-Communicator provides the advantages of a graphic display in a compact, 2-inch, gauge form-factor. This rugged and versatile gauge can be used exclusively or as a complement to any existing instrumentation simply by connection it to an SAE J1939 (CAN) data bus. The stored, directly from the vehicle data bus as text and/or graphics as specified by the customer. The backlit liquid crystal (LC) display is 106 pixels wide and 56 pixels high, providing clear, legible graphics; a dead-fronted warning indicator is positioned above the graphic display window. Three backlit switches with tactile feedback provide a user interface. Backlighting can be red, green, blue amber, or white. The warning indicator can be red or amber. The gauge is sealed to IP67 specifications both front and rear. The gauge operates from 9 to 32 volts DC and includes a switch-to-ground output that can be used to control an external annunciator, relay, or other device. An optional analog input is available for increased flexibility. Designed to withstand harsh conditions typical of off-road environments, the 2-inch display gauge meets all SAE J1455 and J1113 requirements for vehicular instrumentation.